The legacy of one of Michigan's most impactful environmentalist, and how she went on to create the West Michigan Environmental Action Council. Celebrate 45 years of environmental advocacy and education in West Michigan and help WMEAC prepare for 45 more years of action! Join us for awards, great food and music from Hawks and Owls at the beautiful and historic City Flats Ballroom in downtown Grand Rapids. Anyone who has visited the page for WMEAC’s Annual Meeting (and if you haven’t, you should) has seen a woman in a black-and-white picture as part of the event’s flier. The picture is of Joan Wolfe, who founded WMEAC back in 1968 on the way to becoming one of the most prolific environmental activists in Michigan history. Joan Wolfe (née Luedders) and her late husband Willard were drawn to Grand Rapids from Detroit in 1960 in no small part due to the comparative wild wilderness of West Michigan. Two years later, inspired by Rachel Carson’s revolutionary findings in Silent Spring, Wolfe began her activist career at various independent organizations, including the Audubon Society and Trout Unlimited, but was frustrated by the lack of progress these separate groups were making. The citizen action provision of MEPA was first struck down by the Michigan Supreme Court in 2007, then after being briefly reinstated in late 2010 was struck down again in early 2011. The decision was condemned by Wolfe and the organization she founded. Despite the recent setbacks, WMEAC grew considerably during Wolfe’s five years as executive director. By 1973, membership grew to 700 individuals and 60 Grand Rapids-based organizations and, and WMEAC sported an annual budget of $60,000 (roughly $320,000 in today’s dollars, per the Bureau of Labor Statistics). Through a partnership with the Environmental Defense Fund, Wolfe finally saw DDT banned nationwide in 1972. Wolfe’s work eventually caught the attention of Governor William Milliken, and in 1973 she was appointed to the Michigan Natural Resources Commission. The first woman ever to serve on the commission, Wolfe eventually became its chairperson. Later on she would sit on the state’s first Natural Resources Trust Fund Board and the Governor’s Advisory Committee on Electric Energy Alternatives. Wolfe recounted her experiences in her 1991 book Making Things Happen: How to Be an Effective Volunteer, which looked to inspire a new generation of activists. 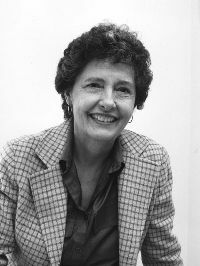 Her distinguished career was recognized with an Honorary Doctorate in Public Service from Western Michigan University, and in 1996 Wolfe was inducted into the Michigan Women’s Hall of Fame. WMEAC would not be the thriving nonprofit it is today without the foundation laid by Joan Wolfe 45 years ago. We invite the public to celebrate her legacy, and those of our other forerunners, at WMEAC’s Annual Meeting on Tuesday, November 12. For details on the annual event visit the event page on the WMEAC website or to RSVP visit the signup form. Thank you for a great story! Joan's fight for our environment is particularly noteworthy because her leadership role is among the very first in a massive 1970s movement of women advancing into professional pathways where few women had gone before. It wasn't that easy. Too many young women now take these advancements for granted. Joan's pioneering efforts were noticed years ago among her peers when she was inducted in the Michigan Women's Hall of Fame. Kudos to her!